Painting Acrylic on Canvas | 32" x 36"
TECHNIQUES AND CREATIVE THINKING Dhananjay has been painting for the last 25 years. He creates graphic and structural uniformity on canvas through the play of light & shade. His paintings are basically a judicious mix of the abstract and realistic forms. His thoughts stem from unique imagination, which combines the real natural world with the artistic and creative world. He finds modernism on canvas with the help mythological and old Indian art . He expresses graphic and cutout form through mythological and old Indian art series with remarkable uses of colours to depict the unknown mysteries in the natural world. His many collections bring out his natural creative talent and total love for art. He paints with oil & acrylic colours on canvas. Dhananjay has been paintings for last 25th year. He was born in 1964, in the terracotta city of Bishnupur, near Kolkata, Having inherited an artistic tradition, he started his art life at the tender age of eight, working with Jamini Roy's paintings , Kalighat pot paintings and terracotta paintings. Once he completed schooling, he decided on a career in art and did a one-year Diploma Course at LA-MARTINIERE SEOMP SOCIATY in Commercial Art, Exhibition Display & Interior Decoration. Simultaneously, he also pursued his graduation studies from Calcutta University. He started his art career in the year 1980 with the aim to become a complete Indian Contemporary Artist. 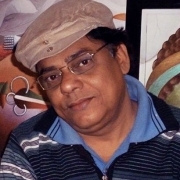 He completed his art education from Rabindra Bharti University (Indian Collage of Arts & Draftsmanship) Calcutta in 1988. He participated in more than 115 shows ( Solo & Group) in India & Abroad.